Way back in the late 1960’s, three of rocks most respected instrumentalists, guitarist Eric Clapton, bassist Jack Bruce and drummer Ginger Baker, all fans of each other’s work, decided to get together and jam, just to see what would happen. We all know the outcome of that session, it became the legendary band CREAM, and all kinds of great music came out of that experiment. The fact that they all were such huge personalities in their own right made it work, although it didn’t last more than a couple of years, again, in part due to their huge personalities and expectations of the public from fans and fellow musicians, and critics alike. Fast forward to a few years ago, when three more of rocks most respected musicians, guitarist/singer Richie Kotzen, super-bassist Billy Sheehan and drummer Mike Portnoy, who for years seems to be in a league of his own, did something similar and jammed in Kotzen’s garage (according to Kotzen..), liked what came out of the session, and decided it was time to form a band. And what a band it became! After releasing their critically acclaimed debut CD in 2013 and touring behind it, they recently released their second CD, Hot Streak, in October and the following tour brought them to a series of shows in Southern California recently. I was lucky to catch them at the beautiful Saban Theater in Beverly Hills, and was treated to an outstanding evening of incredible musicianship on every level. Opening the show was KICKING HAROLD, a hard rocking trio led by singer/ guitarist Tim David Kelly, and featuring the lovely Julia Lage on bass and vocals as well as drummer Michael Odabashian. They performed an enjoyable set of straight ahead rock, sort of in the style of NIRVANA or ALICE IN CHAINS and featured a great down tuned version of the STEPPENWOLF classic “Born To Be Wild”, which also featured a bar or two from the Ted Nugent hit “Stranglehold”. I really like this band, and apparently they were the opening act of the entire tour. After a quick “beer break” THE WINERY DOGS hit the stage at around 9:15 or so and came out smoking with two off their latest, “Oblivion” and “Captain Love”, two of my absolute favorites music and lyric-wise from Hot Streak. The crowd, featuring a mix of fans and music industry insiders were on their feet from the get go. Applauding each and every solo, much like being at a jazz show, they clearly were in for a night of musical ecstasy and they knew it. The title track from Hot Streak is such a funky groove that I could not help myself from “bustin’ a move” from my 10th row center seat (thank you A!!!). The band, especially Mike Portnoy, were on full power. Portnoy, jumping in the air in between beats behind his massive drum kit was clearly enjoying himself and shouting out “what’s up LA?” on numerous occasions. During “Empire”, he exclaimed that he would be using his left foot on the cowbell, and “I need you all to make Will Ferrell proud” in reference of course, to the famous Saturday Night Live cowbell sketch. 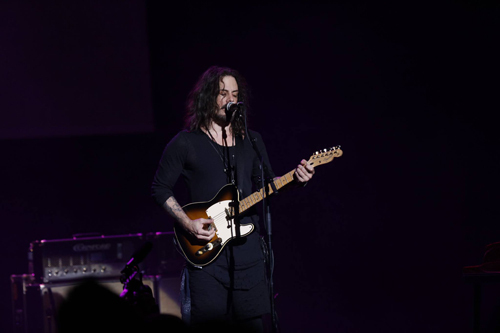 Kotzen took center stage with just an acoustic guitar during “Fire” and it showcased his songwriting skills that have really come a long way in the last few years. His rich, soulful vocals were paired with an electric piano during “Think It Over”, a song that could have been on the radio during its heyday in the 1970’s. Very Sly Stone/Stevie Wonder style stuff, and Kotzen is right up there vocally. Again Portnoy took over. Out from behind his drum kit he jumped and played not only the front of it as well as the hardware, but also used bits of the stage as a percussion instrument, before hauling out a childs “Hello Kitty” toy drumset to beat on for a bit, before using it to bash the cymbals of his own set during a monster drum solo that only a man with the skills and energy that someone like Mike Portnoy can pull off. Naturally, the crowd went crazy, as the band joined in and blasted into “Ghost Town”, a dreamy, mid tempo track from Hot Streak. 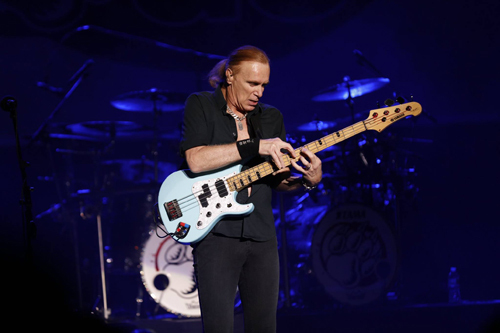 It was now time for Billy Sheehan to showcase his skills. There really is no one in rock that can do with a bass guitar what Sheehan can. A true virtuoso, he shined and completely awed the crowd during his bass solo. Now, most bass solo’s I have witnessed usually mean it’s time to hit the bar for a refill. Not this one. Sheehan incorporates more triplets and harmonics during his solo than most bassists do in a career. Simply mind boggling what this guy can do. Incredibly animated and very entertaining as well. The next for songs spotlighted their debut recording, and the band was indeed “firing on all cylinders”. Kotzen wowed the crowd again and again with blistering guitar riffs, in particular, “Elevate”, which closed the set and is the opening track from said release. 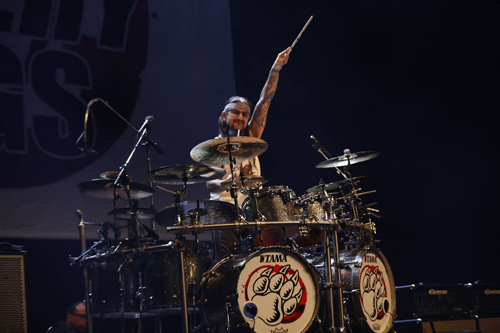 Portnoy, always having fun, clearly enjoying himself, amused himself in between songs by performing tricks with his drum sticks, much to the delight of the crowd, which applauded when he pulled one off, to which he replied “Billy plays like a million notes on his bass and you guys applaud the drum stick tricks”. The band encored, with two more from the debut release. Before launching into the soulful “Regret”, Kotzen thanked the fans for coming out and for allowing them to play over 100 shows. They finished with the groove of grooves “Desire”, in which many in the crowd sang along, word for word. The love in the room for this band was evident in every way, from musicians and industry people, to the core fans, there is huge respect for this band and rightly so. A fantastic musical experience in every way was this evening. I enjoyed every second from start to finish. Not a lot of shows that I can say that about, and I see plenty of them. The band has said that they are planning on even more material which I would love to see. I do hope they take the time and make that happen, and backstage, after the show, everyone seemed to agree. Let us hope that history does not repeat itself, and have this band follow the course of so many “Supergroups” of the past, that have broken up so soon. Long live WINERY DOGS!